Mauser 98 rifle and carbine. Excellent blued reversed fullered blade. E- Lion mark-26 on ricasso with CSZ and capital S on the reverse side. Very nice pommel and crossguard. Muzzle ring partly removed and rounded. (Long high ears!) T/O pommel slot. Z in circle (=BRNO made)on crossguard. Pommel is regimental marked 106.D over 836 This is an Artillery bataillon marking. Very nice wooden grips with oil whole, screwed to the tang. Excellent blued metal scabbard with CSZ and E- Lion mark- 26 crisp on frog stud. No dents. 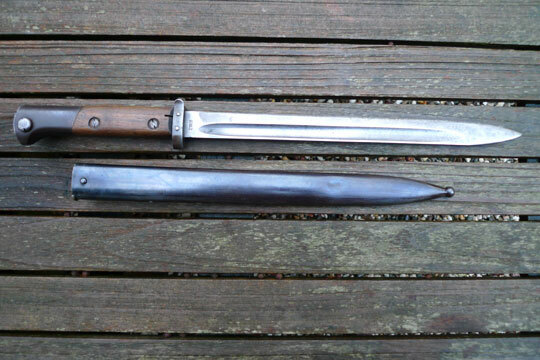 This is a German altered VZ24 bayonet, but no German markings.